Our philosophy with our 43 acres is to create a property that our children might raise their children on some day... this is our legacy we will pass along for hopefully many generations to come. We raise our own animals for meat & eggs, and have planted trees and gardens to harvest. As the son of an architect, I (Bubs) wanted to design our home based on our property and its views, and what we wanted / needed for our growing family. The home has 4 bedrooms & 4 Bathrooms and is roughly 3,200 sqft. The south facing side has a 76ft deck that looks out across our acreage towards the majestic Mauna Kea mountain which stands nearly 14,000ft tall. The upstairs master bathroom has a large picture window that looks west out to Waipio valley and the waterfalls that creep down its sides. Our two car garage, like most garages, can barely fit two cars inside because of all the projects we have waiting to be built or installed. We have a small flock of about a dozen Welsummer & Barred Rock hens and Hehe our resident Welsummer rooster. We selected these two breeds because they are great egg layers and do well free ranging as we keep them on a bout an acre where they are free to forage for their own food, and we supplement with organic lay pellets. We firmly believe that no person can truly own the land, but that for a period of time we have the privilege to be stewards of it... and it is our full intention to be good stewards. We have set several acres aside for the re-establishment of native forest. More than 100 native Koa, Sandlewood and Ohia trees have been planted to grow and create the canopy which will allow the native understory to develop. We have about 250 sqft of raised garden beds, planted with vegetables, fruits, starches & herbs. 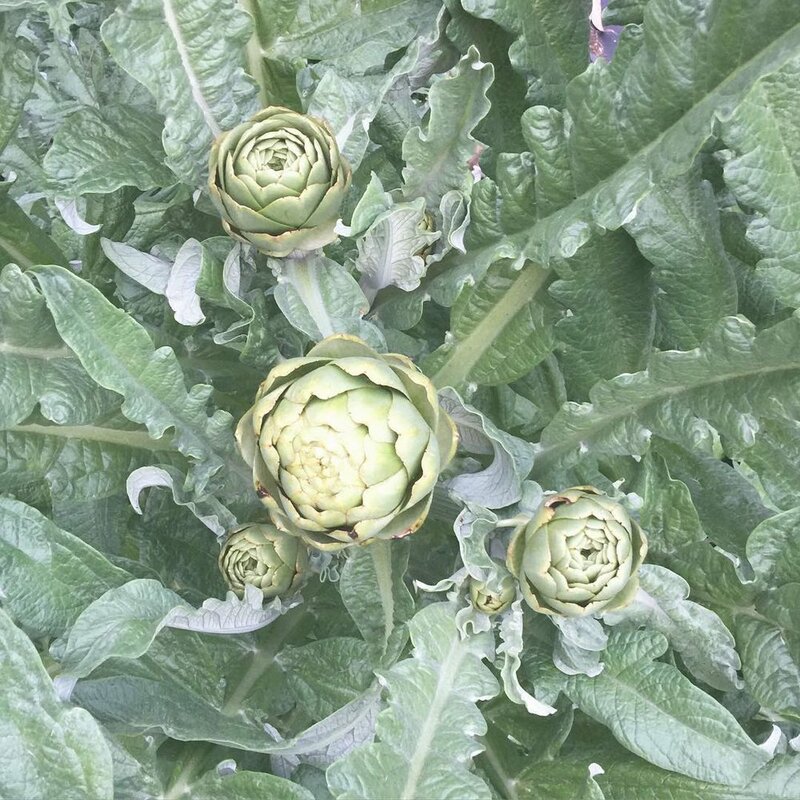 In repurposed wine barrels we are growing our namesake, Artichokes aka edible thistles. In the north orchard we have a variety of 20 fruit trees that can grow at our elevation (2,600ft). In the smaller south orchard we have another dozen fruit & nut trees and hopefully year round avocados growing. We raise registered purebred Dexter Cattle because they are a very friendly, dual-purpose heritage breed that are efficient on pasture and are naturally small. Meet the herd.